Los Angeles often, quite unfairly, gets a bad rap for being a town of superficial fame seekers. Look beyond the surface, and spiritual Los Angeles has a broad reach. Some explore Hindu belief systems, others Buddhism, and yet others more esoteric and non-denominational forms of spirituality. What they all share is a sense of beauty and purpose as pilgrimage destinations in which to honor the sacred (in the self and others) close to home. Paramahansa Yogananda, the author of "Autobiography of a Yogi," established his Self-Realization Fellowship in Los Angeles in 1925. It wasn't until 1952 that he expressed a dying wish to build a special temple retreat in the Pacific Palisades. Years later, after his passing, in 1996, his dream was posthumously realized when the stunning manmade lake shrine was completed. Today, you can visit the calm oasis of spirituality for an hour, a day, or even longer as a retreat guest (sleeping quarters are located in an upper-level building that overlooks the ocean). The magic of Hollywood affects different people in different ways. For some, it's about fame and fortune, while for others, it involves spiritual retreat. The latter was the case for famous author Christopher Isherwood who spent time at the Vedanta Temple under the tutelage of Swami Prabhavananda. The result was his book "My Guru and His Disciple," and a renewed spiritual outlook on life. The temple remains open and accessible to this day. Tucked away in the Hollywood Hills, the Vedanta Society of Southern California hosts lectures, classes, vespers, and pujas. It is also home to a bookshop. Theosophy is an old esoteric spiritual belief system whose name is Greek in origin: theos (divine) and sophia (knowledge). It has some of its 20th-century roots in Los Angeles—Hollywood to be exact. Krotona was a Theosophical colony erected in Hollywood in 1912 (it was later moved to Ojai in the '20s). The Hollywood Krotona building was built in 1919. You can still see vestiges of Old Krotona in the form of exotic mystical architecture at Krotona Apartments. The name "Integration" sounds a bit like a science fiction device, and that's not far from the truth. Located near Joshua Tree National Park, the alleged "rejuvenation machine" was constructed by George Van Tassel in the '50s and continues to attract metaphysical seekers and the curious to this day. As the far-out story goes, Van Tassel was contacted telepathically and in person by Venusian aliens who shared with him their technique to rejuvenate human cell tissue (in the form of the odd device he would so famously build). Visitors can visit the big dome for its signature sound bath' or just to observe an odd piece of California sacred architectural history. Whether you're Christian, Catholic, Jewish, non-denominationally devout or just spiritual, a visit to the Monastery of the Angels may well help quiet your mind and renew your spirit. Dominican nuns operate and reside in this magical holy house tucked away in the Hollywood Hills around Beachwood Canyon. It has the distinction of being the first monastery of cloistered nuns in Southern California and was first blessed in 1938. You can spot the nunnery from the road whilst driving in the area and it's a magical sight. The area is also known for its famously make homemade pumpkin bread (which sells like hotcakes—pun intended—around Christmas time). Malibu and its environs are breathtaking and beatific enough as it is. 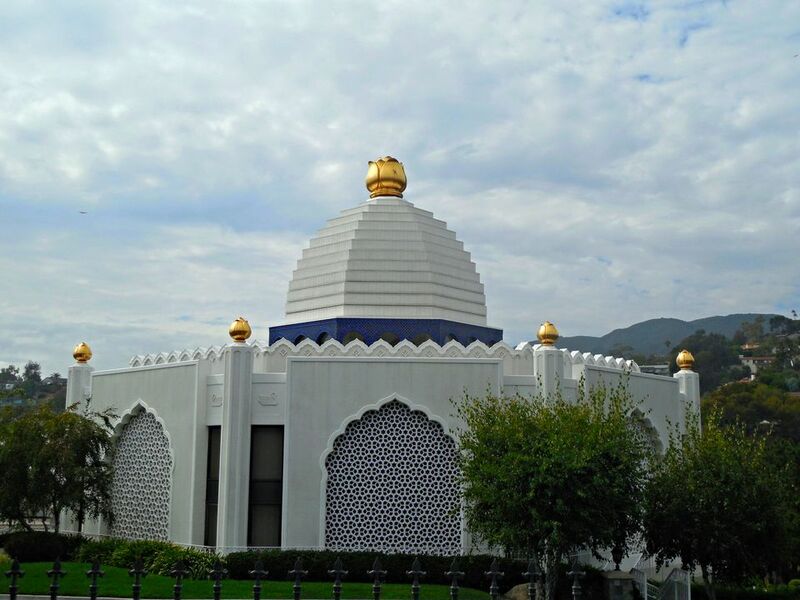 Add to that the Malibu Hindu Temple in Calabasas, and there's no need to leave the state for a spiritual pilgrimage. Built in honor of the Hindu god Venkateswara in 1981, it boasts traditional South Indian architecture and detailing. It is a place of meditation, meetings and even weddings. This tranquil day retreat with its labyrinth and meditation gardens offers city-dwellers a much-needed moment of calm. Bamboo, fountains, trees, and a lily pond are some of its features. A turn-of-the-century mansion fashioned in Italian Renaissance style is also located on the grounds. The Peace Awareness Labyrinth Gardens are the home of the Movement of Spiritual Inner Awareness and of the Peace Theological Seminary & College of Philosophy. Visitors are invited to walk the labyrinth (intended to re-focus and relax the mind) and amble through the gardens. On Sundays, they host garden tours. Founded in 1912, the Koyasan Buddhist Temple is one of the oldest Buddhist temples in North America, in existence today. Located in Little Tokyo, it belongs to the Koyasan Shingon Mission, which was founded by Kobo-Daishi. Its form of Buddhism is also known as mikkyo or secret teaching. The temple celebrated its centennial in 2012.